Having an idea in the back of mind always helps. I sat down to write a blog post today. But I had nothing in mind. Just showing up and writing something in a blank page might work for free writing, but it doesn’t work when you want to write blog posts everyday. As soon as I went blank, I started to think how I wrote a blog post everyday for a month during February. After thinking for sometime, I figured it was because I always had something in my mind during that time. I would play around with some ideas and concepts, and then I’d write about it the next day. I wouldn’t be blank in mind everyday before writing. I would borrow those ideas from other blogs, podcasts, Youtube videos, movies, books, etc. Just consuming something would enable me to gather some ideas for the blog post. Having idea in the back of mind always helps. Not only for writing blog posts, but for other social events like family gatherings and parties as well. You will never run out of things to say when you have something in your mind. Nor will you go out of things to write. The quality & accuracy of your ideas = the quality of your life. Up the ante on the level of ideas and concepts that bounce around in your brain all day. This is the start of all big things for you. Even though she had most of her senses taken from her – sight, hearing, speaking – she still lived a life rich with insight and impactful ideas. You and I have our eyesight and hearing, we have no excuse. Try what I do. Put a book by your bathroom sink while you brush your teeth to get ideas in your spare time. As Thomas Edison said, “Everything comes to him who hustles while he waits.” Don’t just wait for good ideas. Hustle for good ideas. 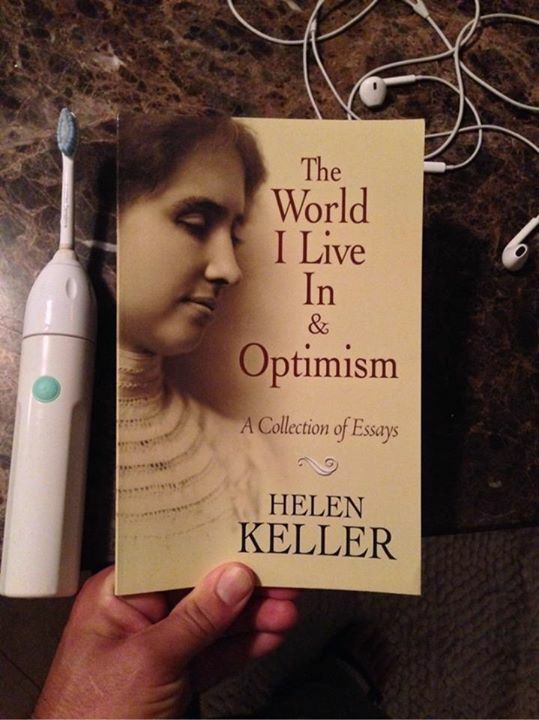 Amazing article, I remember Tai Lopez talking about Helen Keller in his 67 steps and he praised her a lot. Her accomplishments are truly memorable and should be remembered for her triumph and perseverance despite her problems. We follow passion most of the time. But it’s not always passion that matters. It’s how much of a impact you’re making in the world while doing your work that matters. If what you do doesn’t impact the world, at least in a small way, then there’s very little importance of that work in the long run. You might get instant gratification, of course. But that’s not the whole point. The generation before us has left us this world and they have made advancement in every area of human life. That’s why we are able to live comfortably. If the previous generation didn’t do anything then we’d still be in stone age. However, on the other side of the spectrum, due to the advancement, we’re getting weak. We are becoming more and more attached with comfort, which is a bad thing. The previous generation of people could live in jungles hunting and fighting for their life. But now, we don’t even feel safe inside our own house. People during stone age would give everything they’d have to just have a roof above their head. But now, it’s not enough even though the poorest person has that privilege. They had to hunt and gather for food. But now, you can get food easily. But still, you’re unfulfilled. And it’s weird that those people were very happy and fulfilled than we are now. It’s all due to contrast. You don’t have enough contrast in your life. If you go and live in a jungle for a month and come back, you’ll feel gratitude that you at least have a roof above your head. You’ll feel gratitude that we live in a society. That we have people who care about us. We’ve come a far way, but still not satisfied. I’m filled with joy just contemplating the fact that we’ve come a far way and the way we’re living was a dream for the previous generation of people. Advancement happens only when you step out of your comfort zone. We have advanced a lot because the human race hustled for a better life. We are living a comfortable life, and that’s our weakest point. What hurts you today makes you stronger tomorrow. Anything that’s comfortable today will make you weak tomorrow. So, hustle and thrive! Never settle for anything and make sure your work contributes to humanity, at least in a small way.